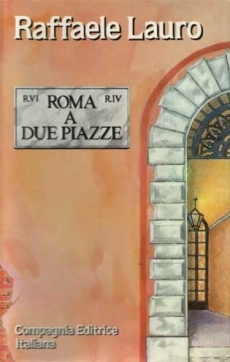 Roma a due piazze is not a novel in the usual meaning of the term. It brings to the reader the unrestricted attention to the plot and to the situations of its characters. The narrative structure is based on a dialogue between two women of our times: Ida and Giulia, well-mannered and with excellent education (one of them is an art critic, and the other one a journalist). In front of a fracture of sentimental nature for the same man (husband of the first one and lover of the other one), the two women are able to discuss the complex underlying reasons for reaching a common understanding, which results not in a collusion, but in a friendly outcome. The protagonists, after an outset on their conflict, recall through literary pretexts historical and non historical characters linked to Piazza Navona and to Piazza di Spagna (the Spanish Steps). The interlocutors live respectively in the vicinity of each of the squares, and from a psychological point of view they consist their emblem. Therefore, the reader has the opportunity to follow a sometimes relentless conversation, which depicts four stories not concluded on a formal level. They get to know the stories of St. Agnes, a victim of religious persecution and political power, and of Donna Olimpia Pamphili (the Pimpaccia), harassed by slander and envy, which are related to the "enclosed" architectural space of Piazza Navona; and those of Fabia, overwhelmed by the romantic myth, and Sabina, a victim of a social illusion, which are proportional to the "open" scenery of Piazza di Spagna (the Spanish Steps). The emerging picture, punctuated by episodes freely drawn from narrative tradition and invention, offers film-like intermissions inspired by the loving consideration for some of the sights of Rome, which are most loved all over the world. But this novel wants to aspire to something more: in an attempt to raise a personal affair between the two initially hostile women, later released by the filter of the evoked female characters and not so much strangers anymore, the story becomes a symbol of a conscious female solidarity and of a new role of women in contemporary society.